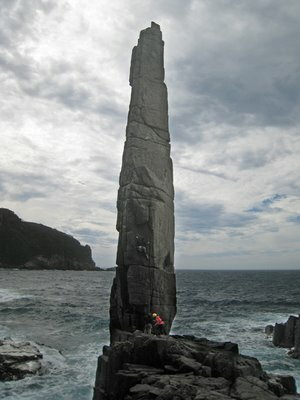 Ever since I saw a picture of the awesome 65 meter high column The Totem Pole standing directly out of the Tasman ocean I have dreamed of climbing it. However, the easiest route is Australian grade 24 (French 7a) which is above my onsight level and the pole thus remains out of reach for me. 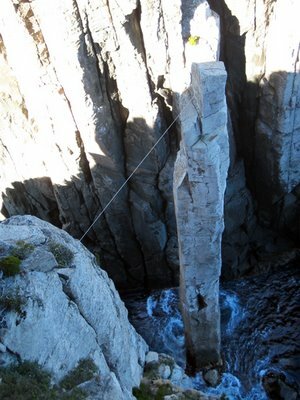 The Totem Pole at Cape Hauy with the Tyrolean traverse in place. The base of the much bigger column The Candlestick is seen behind The Totem Pole. The hike out to The Totem Pole and The Candlestick is worthwhile even if you are not going to climb them - they are in a very beautiful setting. However, when I flipped through the guidebook of selected Tasmanian climbs I stumbled upon The Moai which is another freestanding column albeit on the shore and "only" 35 meters high. I noted the route Sacred Site at Australian grade 18 (French grade 6a, US grade 5.9/5.10a) and another dream was fostered. After climbing the routes Fiddlesticks and Moonraker on the questionable dolerite rock, Elvira had had enough of dolerite climbs and I thus needed another partner for The Moai. 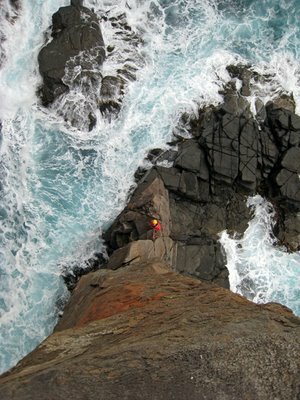 Luckily, Gabrielle’s neighbor Anna Brooks was a climber and was keen on going to The Moai for the third time so we ventured out to Fortescue Bay on February 27. 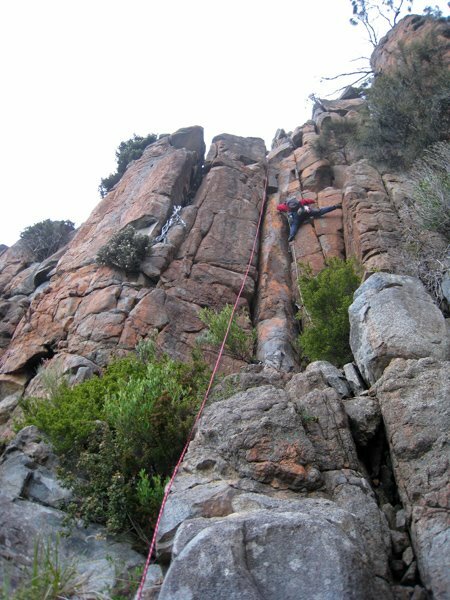 Anna had met two Aussie climbing brothers, Max and Alex, at a previous trip to the Arapiles, and they were also keen on going so we ended up meeting them at the Fortescue Bay camp site. The 2 hour hike to The Moai is worthwhile in itself. 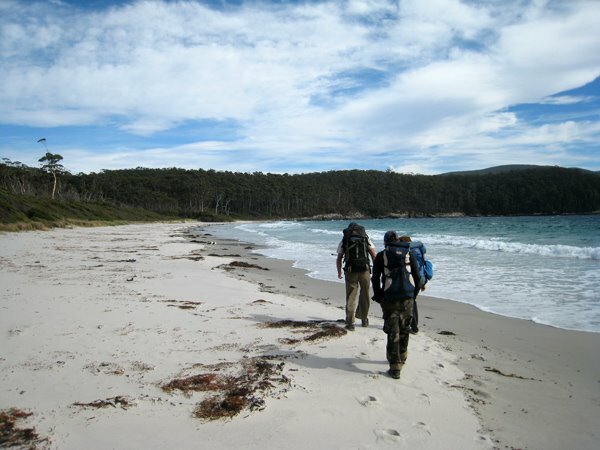 It begins at the beautiful Fortescue Bay beach and then venture into the bush following the coastline and passing several other beautiful bays. It was very nice to have Anna with us as it would otherwise have been tricky to find the turnoff from the hiking path to the rappel anchor leading to the base of The Moai (which is not visible from the hiking path). The beach of Fortescue Bay with the bush in the background. One of the most beautiful approaches to a climb I have ever done! 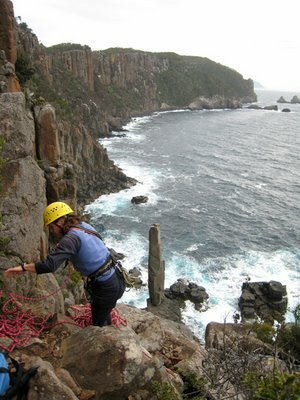 Anna rigging up the rappel to get to the Moai seen below. We had brought an extra 70 m rope to fix at the rappel anchor in order to be able to do the rappel in one go rather than the usual three rappels. It was a very windy day, but luckily The Moai turned out to be somewhat shielded by the shore and it was thus not too bad to climb it. 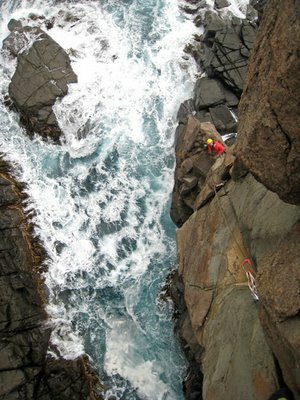 However, the ocean was pretty wild, but we managed to get to the base of the climb without getting wet. Video from the base of the rappel. There are three routes up to the top of The Moai: Sacred Site (18), Burning Spear (22) and Ancient Astronaught (24). Max and Alex initially climbed the Blunt Instrument (alternative first pitch of Burning Spear, grade 20) while Anna and I went for the Sacred Site. Max and Alex climbing Blunt Instrument (20). The leader is at the crux of the first pitch which was quite hard for a grade 20 in my opinion. Two photos looking down at Anna belaying below. The mental crux was just after the second bolt (there are two bolts on the second pitch which otherwise is easy to protect mainly with friends). I clipped the bolt and looked up at rock that looked pretty difficult - then I looked into the white ocean below and sunk my dry spit! However, as I moved upwards I constantly was pleasantly surprised to find good holds. Eventually, I climbed up a big flake with my hands on both sides of it, and just hoped that the whole thing wouldn't pull off! After the flake I moved leftwards and ended up at the fixed top anchors of Ancient Astronaught. It was just great to reach the anchor and yell "Yiieehaaaahhhhh". Video from the summit of The Moai. Anna and Hans at the summit of The Moai. 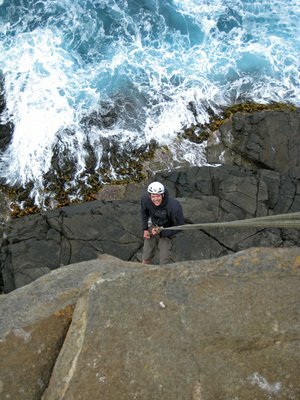 Hans rappelling from the fixed anchor of Ancient Astronaught - one 60 m rope will get you to the base of The Moai. 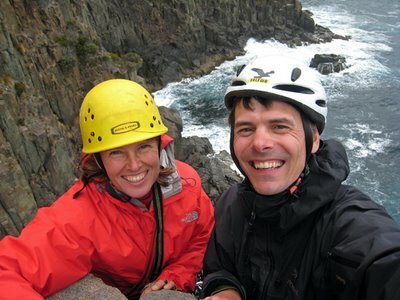 Once we had all climbed The Sacred Site, we started to climb up the route we had previously rappelled. The first step was easy and we thus just climbed it with a prussic on the rappel rope. When we got to the second step I saw the big chimney and yelled "Oh no! Not another chimney!?". However, it was actually quite fun to climb in contrast to the exit chimney on Moonraker on Mt. Wellington, which I had climbed the previous week. Finally, Anna led the last step which was the hardest at Australian grade 16. 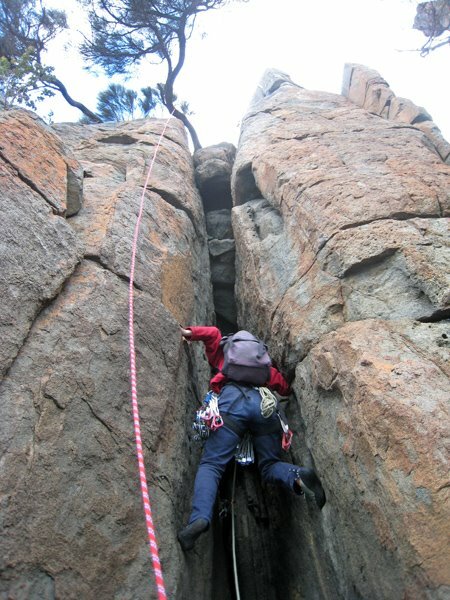 How weird having to climb to get out from a climb! Anna leading the chimney (grade 12) on the second step back to the hiking trail. Anna leading the third step (grade 16) back to the hiking trail. As we started the 2 hour hike back to the car the sun started to set. I was in the front with my headlamp and got startled by several blue penguins standing on the hiking trail! They hurried into their burrows under big wooden logs and I just enjoyed the view and the funny noises from the penguin colony. What a perfect ending of the day! A blue penguin on the trail - an awesome sight! This is one of the most memorable climbs I have ever done and I fully concur with the description in the guidebook: "While there are many cliffs around Fortescue Bay, the prime attraction in the area is a triptych of dolerite spires; the Moai, the Candlestick, and the Totem Pole. Each is totally different from the other two, but they all possess an adventure-climbing flavour that adds to the appeal. 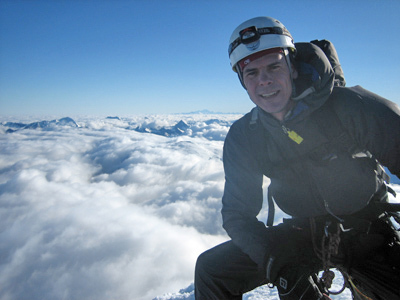 These summits have retained an exclusiveness which is rare given the current popularity of rock-climbing. A trip to any one of them is not just another day at the crags - but it is a day you will surely remember for a long time to come. ".